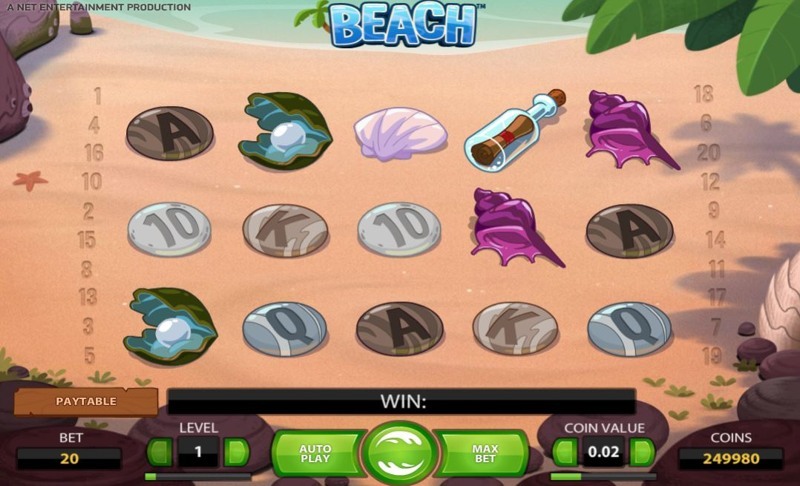 Beach – a Video Slot from Net Entertainment – is an aquatic, sun-filled game, that transports players to a relaxing, summertime beach – no surprises there, of course! Beach is one of Net Entertainment’s most popular Video Slot games, and in particular, it was one of the first games to use the standardized “Net Entertainment layout”, consisting of a simple Auto Play, Spin, and Max Bet button in the bottom-centre of the screen, with various game and stake options available either side. Beach uses 3 rows, 5 reels, and 20 pay lines to deliver a relatively standard Net Entertainment slot layout, and players can spin from as little as 20p per spin, right the way up to £100. The symbols that make up the reels include traditional playing card symbols, including 10, J (Jack), Q (Queen), K (King), and A (Ace), as well as game-specific imagery, which includes a Message in a bottle, Starfish, and Sea Shells. The wild symbol in the game takes the form of a piece of driftwood. Available to players on desktop and laptop devices, Beach is also available to play from most modern smart phones and tablets, and generally, a relatively reliable Internet connection is all that’s needed to begin playing. Beach uses one main bonus-round to deliver the “oomph” factor, and while some players would rather a little more variety in the feature side of things, Net Entertainment manage to offer something new and unique in Beach’s bonus-round – more on that in just a moment. There’s no progressive jackpot or large coin-win prize available, but you can win a decent amount in both the base-game and bonus-round, thanks to high-paying (yet rare) symbols, and playing is smooth and action-packed, thanks to Net Entertainment’s high-quality development standards. The sole feature within Beach, the Free Waves free-spins are triggered by landing three, four, or five of the scatter symbols. 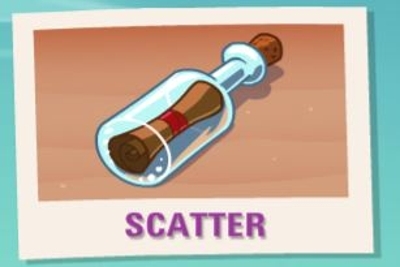 The scatter symbol takes the form of the Message in a Bottle symbol, and can appear on any reel, in any position. Land three of the scatter symbols, and you’ll be awarded 8 free-spins, with 4 or 5 scatter symbols awarding 16, or 24 free-spins accordingly. During the free-spins, you’ll enjoy what’s known as an Octopus Wild; this only appears in the free-spins found, and can only land on the middle (third) reel. When you land him, he’ll do a quick animation where he looks around the reels, and once he’s finished showing off, he’ll duplicate himself up to two times, to replace neighbouring symbols, if it helps you make a higher-paying win than currently stands. For instance, if you landed an Octopus Wild in the middle position, he could extend to reels two and four, so you’d have a wild symbol on the middle three reels, giving you great chances at making 4-of-a-kind or 5-of-a-kind payouts. Unfortunately, it’s not possible to re-trigger the free-spins, although generally, if you manage to land the Octopus Wild twice or more, you’re going to have a decent-paying bonus anyway, so it’s not the end of the world.